Next week My Bloody Valentine play their first US shows of this decade – Friday, August 16th at Austin Music Hall and Saturday the 17th at Grand Prairie’s Verizon Theatre, near Dallas. New Fumes is on both bills – which makes these the Lonestar state’s must-see concerts of 2013. 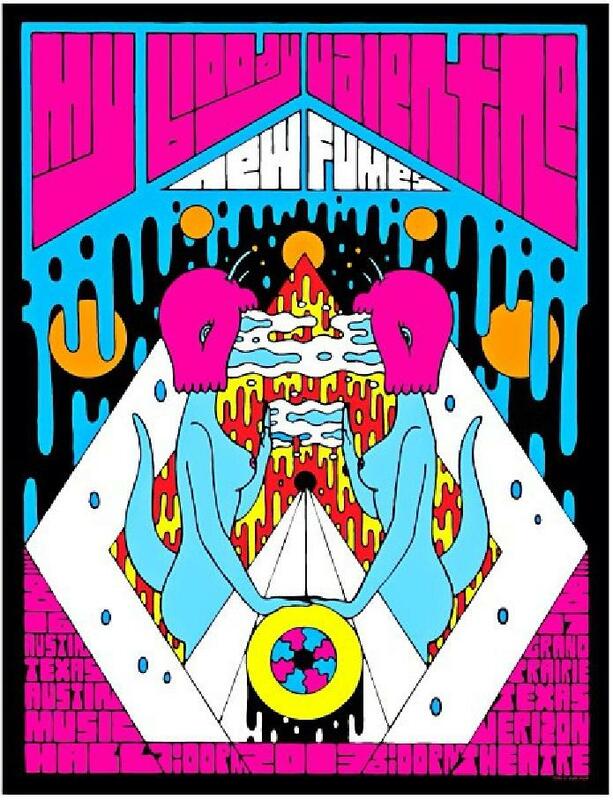 Tickets are still available here and dig the awesome gig poster by Oliver Hibert below. New Fumes addition to these two shows comes on the heels of two projects with famous friends. First, New Fumes was heavily involved in the making of the new Stone Roses remake LP speaheaded by The Flaming Lips and also featuring Foxygen, Stardeath, Peaking Lights, Polica, HOTT MT, Kesha and others – out soon! New Fumes also remixed the new Poly Spree album – listen here. Want more? New Fumes was recently featured in the Oklahoma Gazette. My Bloody Valentine’s return to the US will be brief – the pair of shows with New Fumes in Texas followed by a week of West Coast gigs, culminating with the closing headlining slot of FYF Fest 2013. This will mark their only US festival appearance of this decade so far – and you can win free tickets here, here or here. Yeah Yeah Yeahs headline the first night and other top spots at FYF go to MGMT and Beach House. Every week this summer The Future Heart has been spotlighting chances to win free concert tickets or other goodies. We began in late June with several offers to get free Tame Impala/ Flaming Lips tickets. In early July we linked to similar contests for concerts by The Lips with The Black Keys or Spiritualized. Next came offers for Foxygen tickets, Edward Sharpe and the Magnetic Zeros’ release day secret show, and autographed copies of the new Polyphonic Spree LP, Yes It’s True. Things came full circle at the start of August with another chance to win free Tame Impala/ Flaming Lips tickets. Which brings us to the FYF Fest ticket give-aways – one of the Future Heart’s two “Contests of the week” for next week. The other is free passes to Omaha’s Maha Festival featuring The Flaming Lips, Matt and Kim, Bob Mould and more. Win those here, here, here, here or here. That’s a lot of chances to win.